Atlanta can be confusing to navigate if you’re not a local. The city isn’t laid out in the traditional grid-like pattern, and there are few rectangular blocks or square intersections. This means people visiting Atlanta are using ride-sharing more often than renting a car themselves. If you are familiar with Atlanta’s roads or are willing to learn more about them, this may be the job for you. There is a high demand for Uber and Lyft drivers in Atlanta and you can find out how to become a driver below. When you drive for Lyft or Uber there are requirements you and your vehicle must meet. Below are some of the key points you’ll need to know ahead of time. Lyft Line, Lyft, Lyft Plus and Lyft Premier are available for driving Lyft in Atlanta. 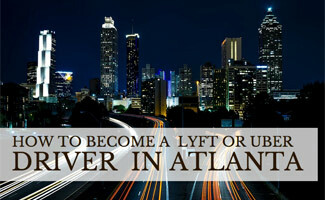 Read the full list of Lyft driver Atlanta requirements. You can drive Uber Atlanta with UberX, uberXL, uberSELECT, uberBLACK and uberSUV. To be an Uber driver-partner in Atlanta check out the full list of Uber requirements. Below are some of the best places to drive for Uber and Lyft during certain times of the day or while events are going on. It’s important to drive during the right time and around the right places or you won’t make as much money. Some of the best times to drive during the daytime are during commute hours: 6am to 9am and 4pm to 8pm. Drive around these places during these hours. Check out some of these venues from 11pm to 3am. Cruising around before and after sporting events and concerts can get you quite a few trips. In general, stay up to date with events going on at these popular venues. These hotels are also recommended to drive around for pickups. This man has some firsthand experience for Uber and Lyft drivers in the Atlanta area. As you can see, there are many options for driving in Atlanta. It’s a large city with high demand for ride-sharing and you can easily make money when you’re not busy with other things. If you’re saving up for a down payment on a house or a new car, this is an excellent way to get money quicker. Why are you interested in driving with Uber or Lyft in Atlanta? The list of popular places is super helpful thanks Kimberly!